The DeWalt DWA25007C Max FIT Screwdriving Bits are the perfect way to maximize your DeWalt power tool system. Featuring the 10X Magnetic Screw Lock System the max fit bits are ideal for use in impact drivers and drill/drivers. Each bit features a precision-machined tip for ideal fit in screw head recesses, resulting in less stripped screws. The Magnetic Screw Lock System holders and sleeve feature a floating ring magnet for fastener retention. Includes: Rapid Load Holder, (4) 1-inch square #2 bits and (3) 1-inch square PH #2 bits. 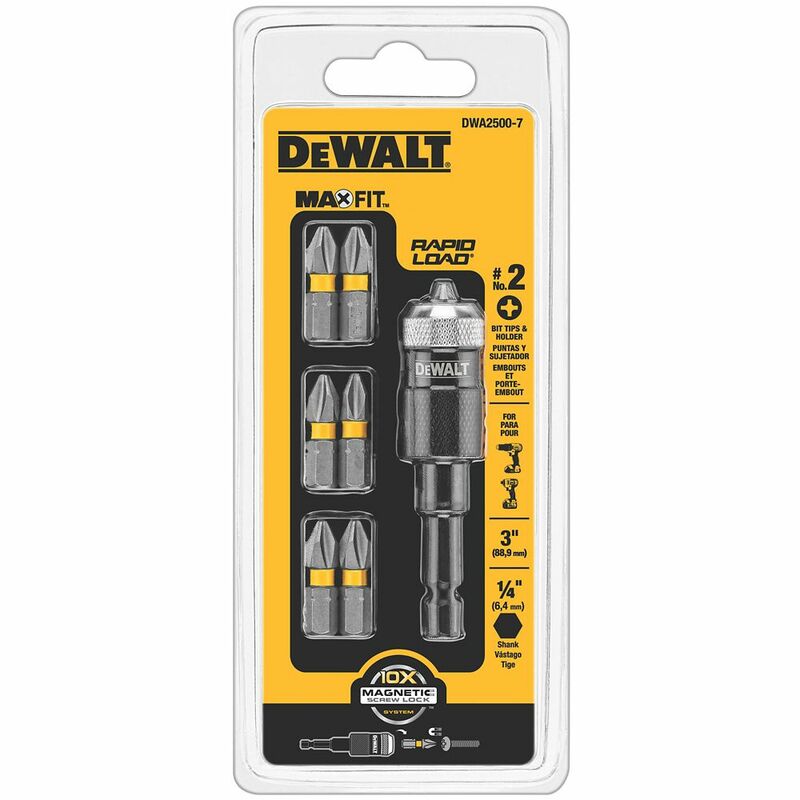 DeWalt Screwdriving Bit Tips are a perfect complement to your drill/driver, and are designed to meet the demands of working professional contractors. Each bit is cut from shock-resistant tool steel and features an advanced hardening process that greatly reduces wear. Its snub-nose design fits perfectly into hex-socket adapters and the tips are precision ground to seat firmly into the screw head. The magnetic drive guide holds 1-inch screwdriver bits to drive screws in a variety of materials. The self-retracting guide sleeve protects fingers and holds screws in place while eliminating wobbling and slipping. Ensuring absolute confidence for the toughest jobsite conditions, DeWalt professional attachments and accessories are designed and continually optimized under real world conditions. DeWalt tools will measure up to the toughest standards because they're rigorously tested under the most demanding conditions to deliver solutions that get the job done better. Guaranteed Tough<sup></sup>. Tired of drill bits that dull quickly and snap under the slightest pressure, Then step up to DEWALT Black Oxide Drill Bits. These industrial-grade twist-drill bits are cut from super-hard, resilient black oxide for the ultimate in durability and strength. Each bit features a 1350 split point for enhanced hole-drilling performance, including quick starts and clean, burr-free holes. For use in wood, metal, plastics and fiberglass. The DEWALT Maxfit Screw driving and Drill Bit Set is ideal for securely fastening a variety of flathead, Phillips, square and torx screws. This versatile, 136-piece set also includes a 14-piece Black Oxide Drill Bit Set for added functionality. These industrial-grade twist-drill bits are cut from super-hard, resilient black oxide for ultimate durability and strength. A magnetic screw lock sleeve is included so you won't drop any fasteners, while the magnetic drive guide helps prevent wobble and slipping when driving screws and other fasteners. 7-Piece Rapid Load Drill Bit Set The DeWalt DWA25007C Max FIT Screwdriving Bits are the perfect way to maximize your DeWalt power tool system. Featuring the 10X Magnetic Screw Lock System the max fit bits are ideal for use in impact drivers and drill/drivers. Each bit features a precision-machined tip for ideal fit in screw head recesses, resulting in less stripped screws. The Magnetic Screw Lock System holders and sleeve feature a floating ring magnet for fastener retention.